TUESDAY, APRIL 9, 2019 Connecting Your Community www.star.kiwi Linwood rallies to help businesses Page 3 Digging down into Riccarton Rd Page 4 EXHIBITORS INVITED NOW Lisa Lynch 021 800 809 Passion for music leaves law behind OVERWHELMED: A special farewell concert will be held for pianist, composer and musical director Matt Everingham before he heads to the United States. PHOTO: MARTIN HUNTER • By Georgia O’Connor-Harding MATT EVERINGHAM could have easily chosen to pursue a prospering career in the legal profession. During the summer he passed a course at the Institute of Professional Legal Studies, which has given him the right to go to court to pass the bar. 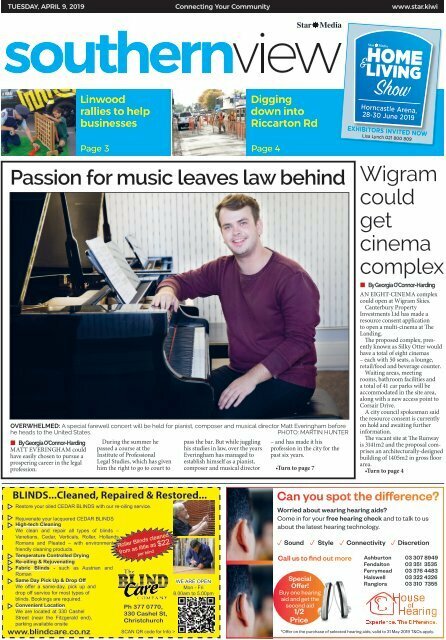 But while juggling his studies in law, over the years Everingham has managed to establish himself as a pianist, composer and musical director – and has made it his profession in the city for the past six years. •Turn to page 7 Wigram could get cinema complex • By Georgia O’Connor-Harding AN EIGHT-CINEMA complex could open at Wigram Skies. Canterbury Property Investments Ltd has made a resource consent application to open a multi-cinema at The Landing. The proposed complex, presently known as Silky Otter would have a total of eight cinemas – each with 50 seats, a lounge, retail/food and beverage counter. Waiting areas, meeting rooms, bathroom facilities and a total of 41 car parks will be accommodated in the site area, along with a new access point to Corsair Drive. A city council spokesman said the resource consent is currently on hold and awaiting further information. The vacant site at The Runway is 3141m2 and the proposal comprises an architecturally-designed building of 1405m2 in gross floor area. •Turn to page 4 BLINDS...Cleaned, Repaired & Restored... Restore your oiled CEDAR BLINDS with our re-oiling service. Rejuvenate your lacquered CEDAR BLINDS High-tech Cleaning We clean and repair all types of blinds – Venetians, Cedar, Verticals, Roller, Hollands, Romans and Pleated – with environmentally friendly cleaning products. Temperature Controlled Drying Re-oiling & Rejuvenating Fabric Blinds - such as Austrian and Roman Same Day Pick Up & Drop Off We offer a same-day, pick up and drop off service for most types of blinds. Bookings are required. Convenient Location We are located at 330 Cashel Street (near the Fitzgerald end), parking available onsite Roller Blinds cleaned from as little as $22 per blind Ph 377 0770, 330 Cashel St, Christchurch www.blindcare.co.nz SCAN QR code for Info > WE ARE OPEN Mon - Fri 8.00am to 5.00pm Can you spot the difference? Worried about wearing hearing aids? Come in for your free hearing check and to talk to us about the latest hearing technology. p Sound p Style Offer! Buy one hearing aid and get the second aid p Connectivity p Discretion Call us to find out more Ashburton 03 307 8949 Fendalton 03 351 3535 Ferrymead 03 376 4483 Special 1/2 Price Halswell 03 322 4326 Rangiora 03 310 7355 *Offer on the purchase of selected hearing aids, valid to 31 May 2019 T&Cs apply.